Recently discovered by archaeologist Dr. George Nash, a wall carving on the Gower Peninsula in South Wales may prove to be one of Britain's oldest examples of rock art. The carving of a speared reindeer is believed to have been created by a hunter-gatherer in the Ice Age more than 14,000 years ago. In a recent Press Release 'Minimum U-Series date makes Welsh discovery the oldest rock art in the British Isles (and North-western Europe)', the new minimum date of 14,505 + 560 years BP may confirm this. Evidence of prehistoric occupation in Britain is abundant in many forms apart from rock art itself. However, the discovery in 2003 of engraved and bas-relief Upper Palaeolithic rock art in Church Hole Cave within Creswell Crags Gorge in Nottinghamshire proved that rock art was practiced in this harsh Ice Age environment, by bands of hunter/fisher/gatherer communities during the summer months, almost certainly for the same ritualistic reasons as their counterparts in a 'warmer' southern Europe. During the Upper Palaeolithic, much of Britain and Ireland was covered by a thick blanket of ice, in places up to 2 km in thickness and it was considered that during this time there was little in the way of a human presence south of the ice margin. The Creswell Crags discovery was, however, to change this and ignite a new approach for the peopling of the British Isles during this harsh climatic period within our distant past. 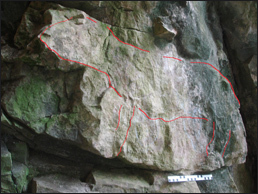 This was in the face of several claims regarding Upper Palaeolithic rock art, all of which were considered scientifically but eventually rejected. In 1912 at Bacon Hole Cave on the Gower Coast, experts of the day found red streaks of haematite within one of the recesses of the cave (Figure 1). This turned out to be either natural haematite secretions or paint. 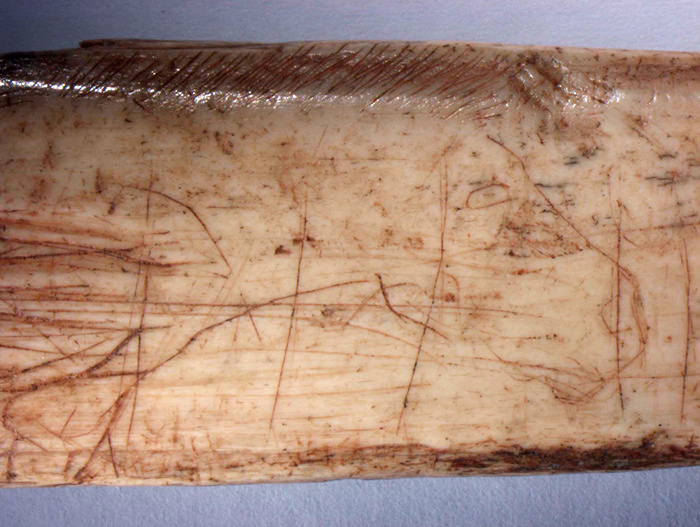 In 1982 in the Wye Valley of South Herefordshire, researchers claimed to have found the outline of a bison and a red deer amongst other animals from Cave 5615 (Figure 2). 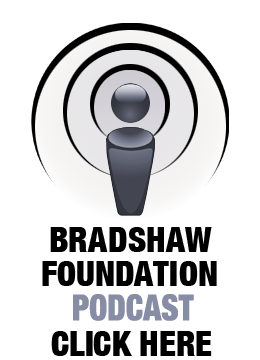 Following much controversy, this too was rejected. It was Creswell Craggs and its nearby caves within the gorge which provided more scientifically accepted evidence, with a series of Upper Palaeolithic mobile artefacts discovered during early 20th century excavations. These included Creswell's 'infamous' horse, that had been carved on a piece of rib bone (Figure 3), and a bird-like head on a human torso which had been carved on a piece of bone from a woolly rhinoceros (Coelodonta antiquitatis), a species which was considered to have been extinct in Britain by 15,000 BC. The presence of these rather exotic artifacts, along with a handful of other portable 'valuables' including perforated shell and stone, made for garment decoration, necklaces and pendants, occur against a backdrop of sometimes rapid climatic fluctuation when average summer temperatures at 12-13,000 BP were around between 0 and -5 degrees centigrade. 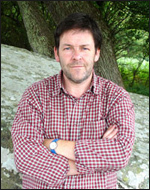 In September 2011, Dr George Nash, as part of the team, was exploring the rear section of a limestone cave that stands within the eastern part of an inland valley on the Gower Peninsula, approximately 2 km north of the present coast line. The first excavation in this cave was undertaken during the mid to late 19th century when a large section of the cave floor was excavated. An array of flint tools, metal implements and pottery dating from the Upper Palaeolithic to the Bronze Age were recovered from the excavation, plus a significant Pleistocene faunal assemblage that included (extinct) elephant, giant deer, hyena, reindeer, woolly rhinoceros and wolf. Probably found within the upper stratigraphy was a small collection of domesticated bone including that of goat, pig and sheep that dated to the Neolithic or Bronze Age periods. Unfortunately, and typical of this time, no stratigraphic records were made. Accompanying these later prehistoric deposits was evidence of human burial, but again no archaeological clear records survive. 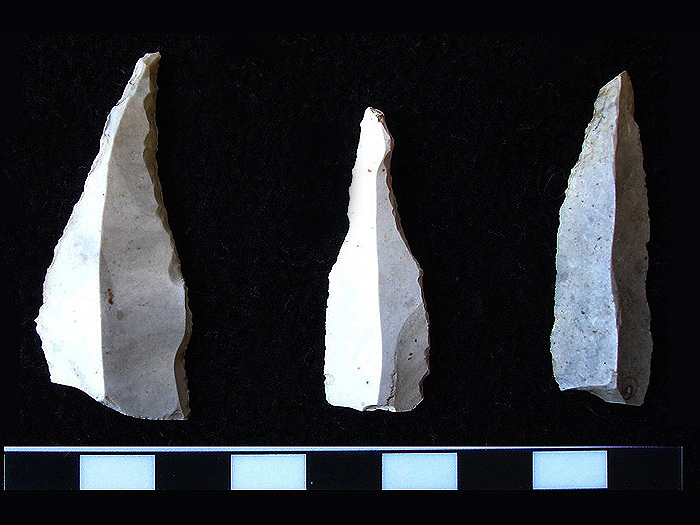 According to Dr George Nash, the majority of the lithic assemblage appeared to have originated from the Late Upper Palaeolithic and was similar to those found within trenching from a well-recorded excavation made, during the latter half of the 20th century, outside the entrance of the cave. Recovered from this excavation were more than 300 lithics, many of which were diagnostically similar to flint blades and points found at other so-called Creswellian cave sites at Creswell Crags and within Cheddar Gorge (Figure 4). In addition to this Late Upper Palaeolithic assemblage were two tanged points that were identified as dating to c. 28,000 BP suggesting that the cave had been subjected to a much earlier occupation at a time when the British Isles and most of north-western Europe were firmly gripped in an ice age (known as the Devensian). At this time, and until the glacial retreat around 14,000 BP, the Bristol Channel was then a seasonally lush landmass that extended to the present day north Devon and Cornwall coastline. 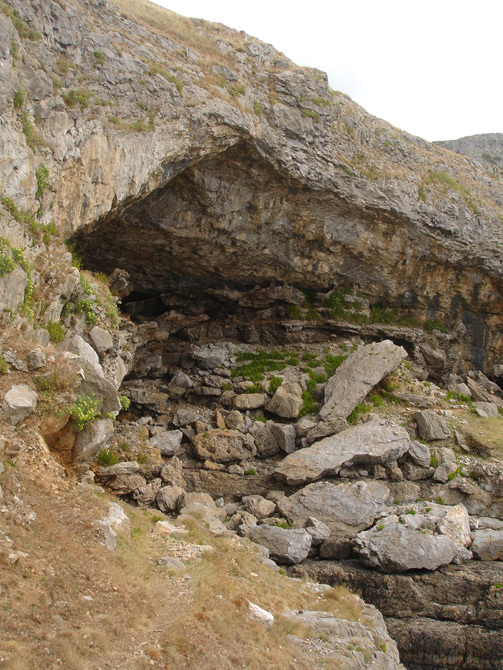 Following the retreat of the Welsh ice sheets, groups of advanced hunter/fisher/gatherers would have utilised this sometimes hostile landscape, seasonally occupying many of the caves that are cut and shaped into the limestone Accompanying these small self-contained communities were herds of large migratory herbivores that included bison, elk, horse, mammoth and reindeer. In 2007 the cave was explored by members of the Clifton Antiquarian Club from Bristol in search of rock art. 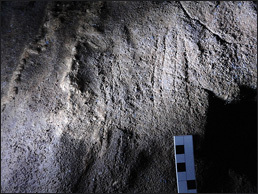 The first visit resulted in the discovery of several cave bear (possibly Ursus arctos) claw scratches that were made following a probable hibernation episode (Figure 5). 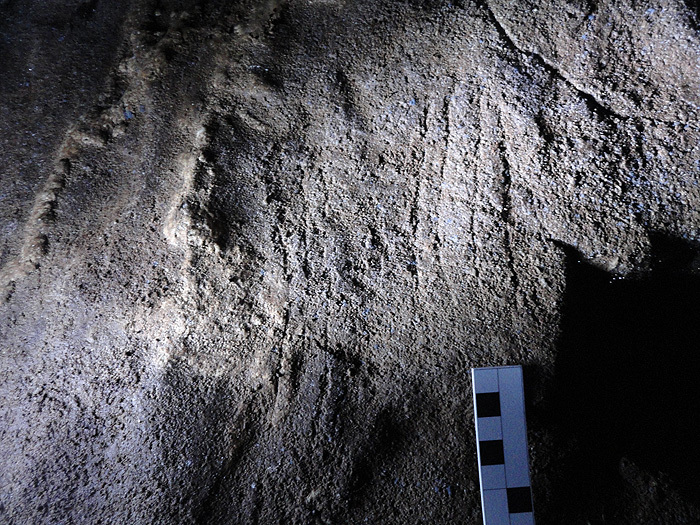 Possible engraved geometric patterns were also found within an antechamber, located north of the main gallery. 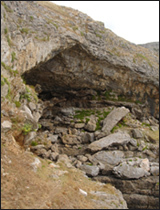 However, the limestone throughout the cave is traversed by innumerable small-scale natural fractures and it was eventually considered to be a natural phenomenon.